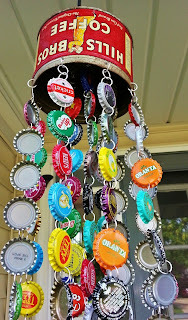 A friend mentioned that she was making a bottle cap wind chime and my mind started dancing! The principle is so simple and it can be put together in an infinite number of ways. Part of the fun is finding the bottle caps and the topper. I ordered some soda caps on Ebay so I could get a fun variety and didn't have to wade through oodles of soda. Using an awl and a small hammer, I punched a hole in two edges of each cap. This was a fun camping activity and I grabbed a piece of firewood to punch into. 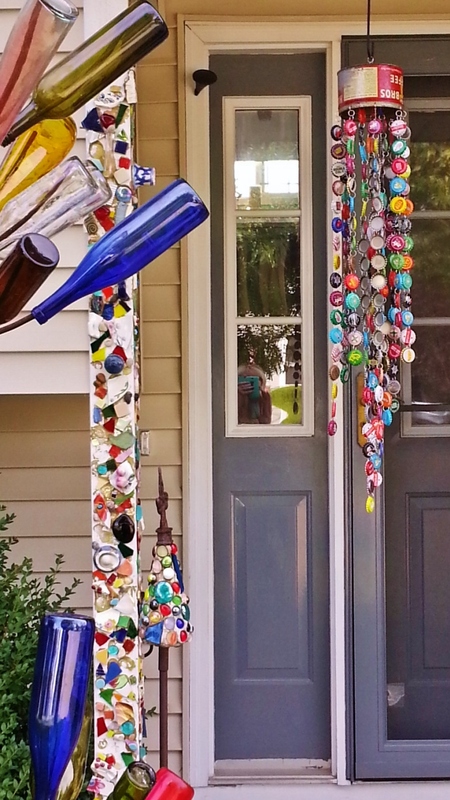 There are over 150 caps in this chime, so it took awhile. Then I used pliers and jump rings to attach the caps into long chains. Thicker rings worked a little better, as the caps have a tendency to slip off smaller ones. You could use wire and create your own as well. You can use a vintage colander, tin or pretty much any old thing as a topper. 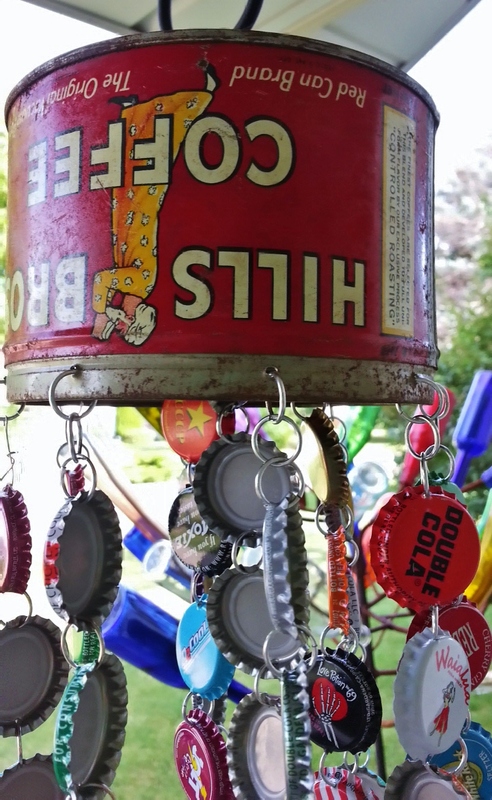 I found this Hills Brothers coffee tin from an antiques vendor and punched holes along the sides and top to attach to my bottle cap chains. These are so fun, I HAVE to make some more! I ordered this assortment from Amazon...along with the rings and a punch tool. I happen to already have this exact antique coffee tin. Can't wait to get started!! She got them off Amazon. They're not rusting much at this point. I imagine some are aluminum but those which aren't may get rusty over time. Thanks for this! My son collects bottle caps (we have millions I'm sure), so this is a perfect project to use and enjoy some of them. His dad is bring him some from his trip to Africa, so that will make a nice trip souvenir. 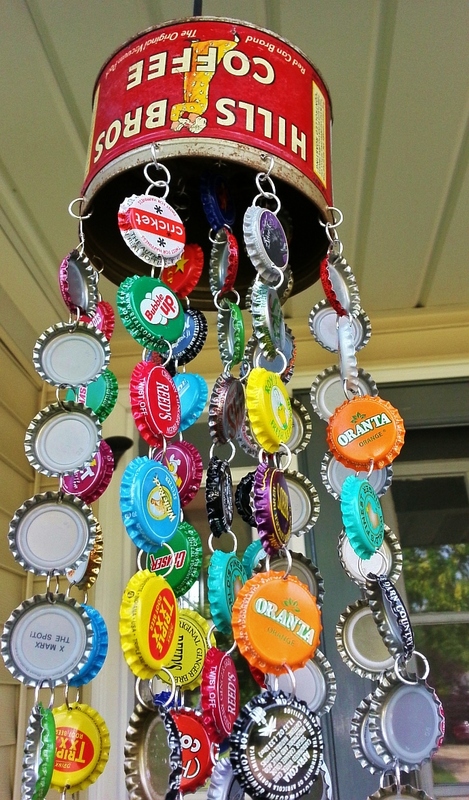 I love it, I have a "crap-load" of bottle caps, I will be trying this for sure. Great proj Just one question ....How do you make the holes in caps? I used a small nail and hammer and punched thru from the inside. Kelli~ Do you remember what size jump rings you used? Did you get them at a hardware store or did you use the kind for making jewelry? I say thanks for posting as a blog with directions how you did it - all I was finding were ones that are for sale so already done and no instructions. Thanks Amanda! I'm really enjoying mine...I hear it gently chattering outside my window right now. Jump rings...got them on eBay for another project but they were too big. You need to make sure they're big enough to go through two bottle cap edges. I think maybe 11mm? Working on a whole bottle cap tree right now. Some pix on facebook. Jump rings maybe size 11mm, got them on eBay. What did you use to hang the whole thing from? 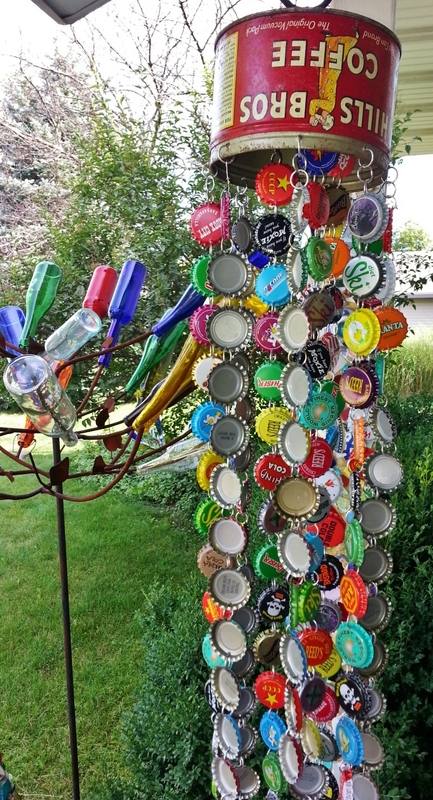 I think this is great and have a great collection of bottle caps and a friend who would love this. Thanks for the post! Can't remember but they are pretty large. 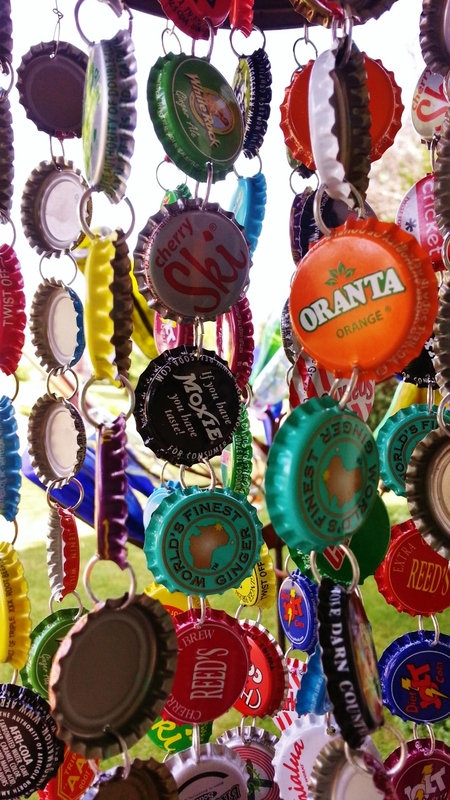 I love your chime and i have been saving bottle caps too make one. They just always seem to be bent. Wanted to say thank you on what size jump rings to use and where to find them. Sorry to say I've looked at my history on ebay and can't find what size jump rings I purchased, but they are pretty large. They need to accommodate both edges of the caps. Probably around 12mm? Did you do something to flare the edges of the caps? I've been saving caps since I first saw this and now I am a sahm I have time to do it! I didn't do anything to the caps--some are used and some are unused. Either way should be fine! Here's a tip for everyone...if you want to place yours in the sun or elements, spray the caps with a uv protectant (look for a clear gloss spray) so they'll be protected. The sun can be vicious!